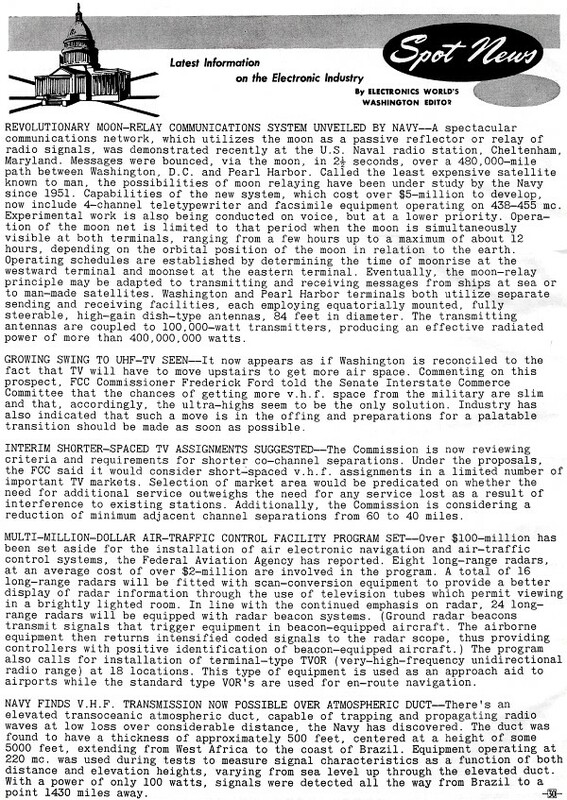 Television broadcast stations were quickly growing in number in the post-Korean War era and the FCC needed to devise a scheme for accommodating more channels. 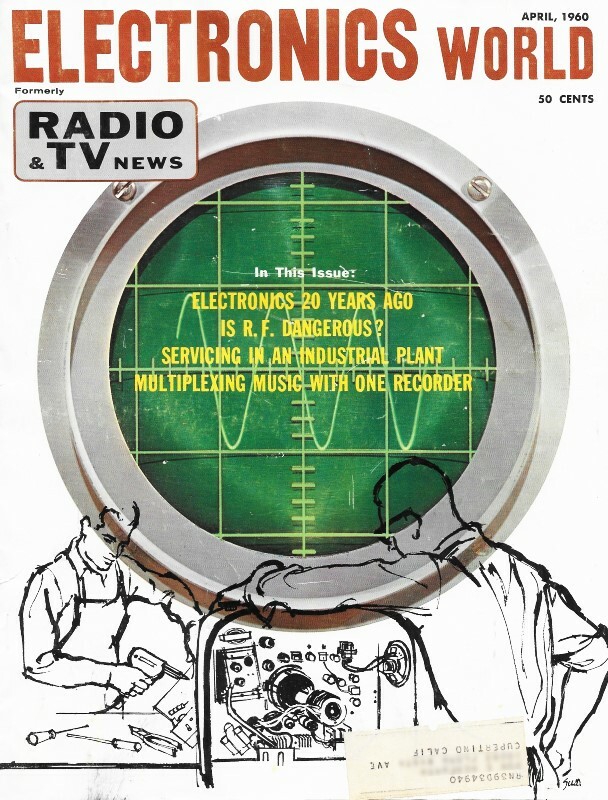 There were only 13 channels (only 2-13 used) allocated in the VHF spectrum with 6 MHz-wide bands. Even though VHF propagates primarily in a line-of-sight mode, reflections and earth-bounce can extend the range fairly significantly, limiting density in closely spaced cities. The military refused to yield any spectrum so a decision was made to add new channels (14-83, also 6 MHz wide) in the UHF band. UHF presented its own problems with more difficult equipment manufacturing issues and higher atmospheric attenuation. It never really caught on because cable TV was being widely installed in metro areas and even into suburbs by the early 1960s. Over-the-air (OTA) transmission issues were eliminated, resulting in vastly superior reception quality, and as a bonus even more channels were available. Earth-Moon-Earth (EME) radio communication was first demonstrated by the U.S. Army in 1946. It was in a way the first type of satellite communications, the moon being Earth's lone natural satellite. 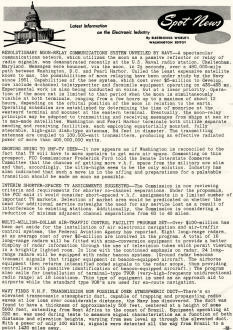 Up until the late 1950's when artificial satellites began filling the skies, military services built strategic communications networks to exploit the ability. Compared to modern equipment that many amateur radio operators use for EME contacts, the required transmitter power and receiver sensitivity was very expensive. Operating in the 450 MHz band, 100 kW transmitters and 85-foot diameter, steerable parabolic antennas were needed to reliable links as far apart as Washington, D.C., and Pearl Harbor, Hawaii. Hams now conduct EME using both simple CW (Morse code) and specially designed digital processing modes (JT65). See MoonBouncers.org for lots of info. Revolutionary Moon-Relay Communications System Unveiled by Navy - A spectacular communications network, which utilizes the moon as a passive reflector or relay of radio signals, was demonstrated recently at the U.S. Naval radio station, Cheltenham, Maryland. Messages were bounced, via the moon, in 2 1/2 seconds, over a 480,000-mile path between Washington, D.C. and Pearl Harbor. Called the least expensive satellite known to man, the possibilities of moon relaying have been under study by the Navy since 1951. Capabilities of the new system, which cost over $5-million to develop, now include 4-channel teletypewriter and facsimile equipment operating on 438-455 mc. Experimental work is also being conducted on voice, but at a lower priority. Operation of the moon net is limited to that period when the moon is simultaneously visible at both terminals, ranging from a few hours up to a maximum of about 12 hours, depending on the orbital position of the moon in relation to the earth. Operating schedules are established by determining the time of moonrise at the westward terminal and moonset at the eastern terminal. Eventually, the moon-relay principle may be adapted to transmitting and receiving messages from ships at sea or to man-made satellites. Washington and Pearl Harbor terminals both utilize separate sending and receiving facilities, each employing equatorially mounted, fully steerable, high-gain dish-type antennas, 84 feet in diameter. The transmitting antennas are coupled to 100,000-watt transmitters, producing an effective radiated power of more than 400,000,000 watts. Growing Swing to UHF-TV Seen - It now appears as if Washington is reconciled to the fact that TV will have to move upstairs to get more air space. Commenting on this prospect, FCC Commissioner Frederick Ford told the Senate Interstate Commerce Committee that the chances of getting more v.h.f. space from the military are slim and that, accordingly, the ultra-highs seem to be the only solution. Industry has also indicated that such a move is in the offing and preparations for a palatable transition should be made as soon as possible. Interim Shorter-Spaced TV Assignments Suggested - The Commission is now reviewing criteria and requirements for shorter co-channel separations. Under the proposals, the FCC said it would consider short-spaced v.h.f. assignments in a limited number of important TV markets. Selection of market area would be predicated on whether the need for additional service outweighs the need for any service lost as a result of interference to existing stations. Additionally, the Commission is considering a reduction of minimum adjacent channel separations from 60 to 40 miles. Multi-Million-Dollar Air-Traffic Control Facility Program Set - Over $100-million has been set aside for the installation of air electronic navigation and air-traffic control systems, the Federal Aviation Agency has reported. Eight long-range radars, at an average cost of over $2-million are involved in the program. A total of 16 long-range radars will be fitted with scan-conversion equipment to provide a better display of radar information through the use of television tubes which permit viewing in a brightly lighted room. In line with the continued emphasis on radar, 24 long-range radars will be equipped with radar beacon systems. (Ground radar beacons transmit signals that trigger equipment in beacon-equipped aircraft. The airborne equipment then returns intensified coded signals to the radar scope, thus providing controllers with positive identification of beacon-equipped aircraft.) The program also calls for installation of terminal-type TVOR (very-high-frequency unidirectional radio range) at 18 locations. This type of equipment is used as an approach aid to airports while the standard type VOR's are used for en-route navigation. Navy Finds V.H.F. Transmission Now Possible Over Atmospheric Duct - There's an elevated transoceanic atmospheric duct, capable of trapping and propagating radio waves at low loss over considerable distance, the Navy has discovered. The duct was found to have a thickness of approximately 500 feet, centered at a height of some 5000 feet, extending from West Africa to the coast of Brazil. Equipment operating at 220 mc. was used during tests to measure signal characteristics as a function of both distance and elevation heights, varying from sea level up through the elevated duct. With a power of only 100 watts, signals were detected all the way from Brazil to a point 1430 miles away.